I’ve always eaten breakfast; it’s just one of those things that was drummed into me as a child. My parents wouldn’t let me leave the house until I ate a bowl of cereal, had some oatmeal, ate some fruit or had some toast. It was like the rule that could never be broken! Being a super-active kid meant that I needed my breakfast and I needed all those carbs too! Carbs are great for energy and that’s something growing, active kids need in abundance. So as an adult, I continued to be a consistent breakfast eater but, to my horror, I also discovered that those once-essential carbs were actually something I needed less of. You see, if you have carbs for breakfast, you elevate your blood sugar levels. In response, your body produces and releases the hormone insulin which lowers your blood sugar levels again. However, insulin is often too good at its job and you end up feeling tired and hungry. So what do you do? Eat more carbs of course! This roller-coasted of blood sugar highs and lows can leave you suffering from sugar cravings, undulating energy levels, more sugar cravings, and lead to weight gain too. You see, you will probably overeat when your blood sugar levels are low and the presence of insulin turns your body from a fat burner and into a fat storer – not what you need, right? After doing some reading and experimentation, I discovered that eating protein for breakfast is much better than eating carbs so I made this simple swap and the rest, as the saying goes, is history. Protein stays in your stomach for longer than carbohydrate. It’s a little harder to digest and so you feel fuller for longer. Not feeling hungry means you won’t be tempted to grab a donut with your midmorning coffee and that means you’ll save calories and lose weight faster. All foods contain calories but not all calories were created equal! It takes differing amounts of energy to break down a calorie of fat, carbohydrate, and protein. This is properly called the Thermic Effect of Food (TEF for short). The higher the TEF, the more calories eating and digesting food will use. And yes, you guessed it, protein has the highest TEF. Swapping carbohydrate for protein means you’ll use more calories eating and digesting your food which will boost your metabolism and lead to faster weight loss. Cool or what!? Your body converts carbohydrates into sugar – specifically glucose. Elevated blood sugar levels wreak havoc on everything from your appetite to your ability to burn fat. High blood sugar levels are also linked to many diseases including diabetes. Protein is converted into amino acids which are nothing like sugar. Amino acids do not raise your blood sugar levels and require very small amounts of insulin to transport them to their destinations. Switching from carbs to protean for breakfast means you blood sugar levels start low and stay stable – a real benefit on so many levels. Eggs – poached, scrambled, fried – I love eggs! A couple of eggs in the morning provides plenty of protein and some healthy fats. 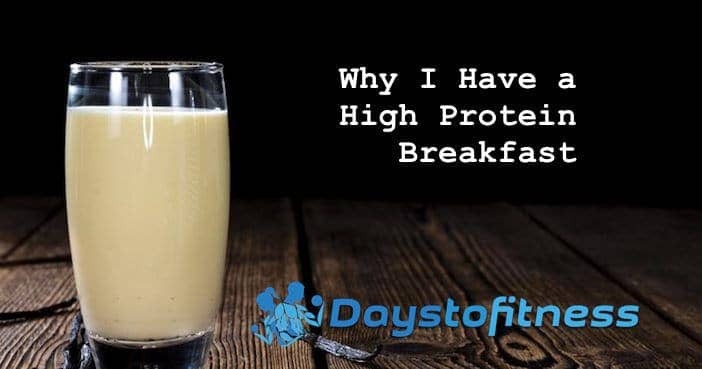 Switching to a high protein breakfast is probably one of the most important things you can do to lose weight and be healthier. Almost all traditional breakfast foods are high in carbs and sugar and the opposite of what you need first thing in the morning. Ditch the carbs and embrace protein – I know you’ll love the benefits! Next Article Meal Replacement Shake for Breakfast – Why?